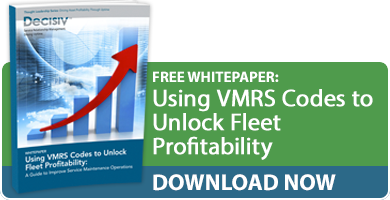 Is Your Fleet Maintenance Management Headed for a Crash? Your fleet’s been managing maintenance the same way for years, even decades. You know your trucks. You know your technicians. You know your local dealers. You know the parts you’re going to need. Your system works just fine. Until it doesn’t. There’s no getting around it: Fleet maintenance is changing. Technicians are becoming harder to recruit and retain. Trucks now come loaded with complicated technologies. Dealerships and providers are consolidating and your friend no longer works there. It’s a different world out there, and doing things the way you always have just isn’t going to cut it. Keep reading to learn the red flags you need to watch for that indicate your fleet maintenance is headed for trouble, and for the solutions you need to make a positive impact on your bottom line. Watch out for these six warning signs that your fleet maintnance management is putting your profits and operational efficiencies at risk. Thinking that you can’t impact truck TCO and bottom-line profitability by improving your service and maintenance processes doesn’t make sense in today’s data-driven business world. With the right tools and a proactive approach, your fleet maintenance operation can be a strategic advantage for your fleet. Far too many fleets don’t focus on TCO or important metrics and KPIs, and instead continue to use cost-per-mile as an indication of process health. If your calculation doesn’t include hidden maintenance costs like rentals, safety stock, poor warranty dollar recapture, over- and sometime double-payment on some repairs, as well as damaged relationships with shippers due to missed delivery targets, you’re missing a lot. You’ve got a siloed fleet management system. Service providers have their own siloed systems. You’re both not sharing real-time data with one another. When your trucks are in their repair bays, you have no idea what’s really going on until out of the blue you finally find out that the truck is ready for pick-up. If the odometer and a calendar are the only factors you consider when setting PM schedules, you’re only looking at a very small part of the picture. You’re ignoring other vital factors such as engine hours (duty cycle), inspection failures and breakdown root cause analysis, among others. If you’re manually entering fleet maintenance data or not including sources such as telematics-based fault codes, you’re not only wasting hours on a task that should be automated, you’re also missing an opportunity to identify critical issues and fleet trends in real time. If you’re not consistently monitoring crucial fleet metrics such as downtime and TCO, you’ll have no idea if your processes have taken a serious wrong turn that’s negatively impacting your bottom line. If your fleet maintenance management processes are stuck in the past and headed in the wrong direction, there’s still time to turn your operations around. Fleets can no longer treat maintenance as a cost of doing business. Maximizing uptime and minimizing your total cost of ownership (TCO) are critical strategic initiatives that require a different way of thinking and working. You always need to adapt to a changing labor market. More work is getting outsourced as quality technicians become harder to find. Because of this, you must shift your focus from parts inventory and technician management to process and communication management. Executives who view maintenance as an opportunity for competitive advantage will lower costs and improve efficiency in their fleets. In other words, fleets that move from a shop management focus to a more holistic approach will be more competitively positioned going forward. As the fleet maintenance world faces steeper and more complex challenges, the question of whether to embrace new technology becomes a matter of when, not if. An approach focusing on process and communication management requires leveraging new tools and big data to drive decision-making. For instance, Service Relationship Management (SRM) technology integrates all of the capabilities of fleet maintenance management software with those of the software that dealers, OEMs and repair shops use. The technology also includes enhanced communication tools that ensure every stakeholder is on the same page. With these capabilities, you can turn your fleet maintenance operations into a strategic advantage, limit downtime, control costs and reduce stress across the entire service supply chain.